Prior to 1855, people disembarking from ships in New York did not have to go through any inspection process. They could go directly to the wharfs without even being screened for contagious diseases. From 1855 to 1890, immigrants arriving at the port of New York landed in what was called "Castle Garden," (a former opera house) which was located at the southern tip of Manhattan. At that time, the federal government had a contract with the State of New York to inspect and process all those wanted to immigrate. In 1890, with a new wave of immigration, the federal government decided that it wanted to take control of this process, and could thus screen out all of the undesirable arrivals, e.g. those who were sick or so poor that they would be a burden on the nation. The state wouldn’t let the federal government use Castle Garden, so a new center was needed. Between 1890 and 1892, while a new building was being constructed, people were screened at the Old Barge House near the U.S. Customs Office at the southeast end of Manhattan. Then, in 1892, Ellis Island was ready. When Ellis Island was first built it was made of wood. It became the primary stop to process immigrants beginning on Jan. 2, 1892. However, there was a fire there in 1897, and it was forced to close for a period of time. All screening of new immigrants once again had to be done at the Old Barge Office until mid-December 1900. Ellis Island was rebuilt and ready to reopen, this time not made of wood but of a fireproof material, and once again began to perform its intended function. Immigration reached its peak in 1906. Then, in 1924, with a new immigration law, those wanting to enter the U.S. had to visit the U.S. consulate in their own country to obtain a visa. There they would be screened, eliminating the necessity for Ellis Island to do so. 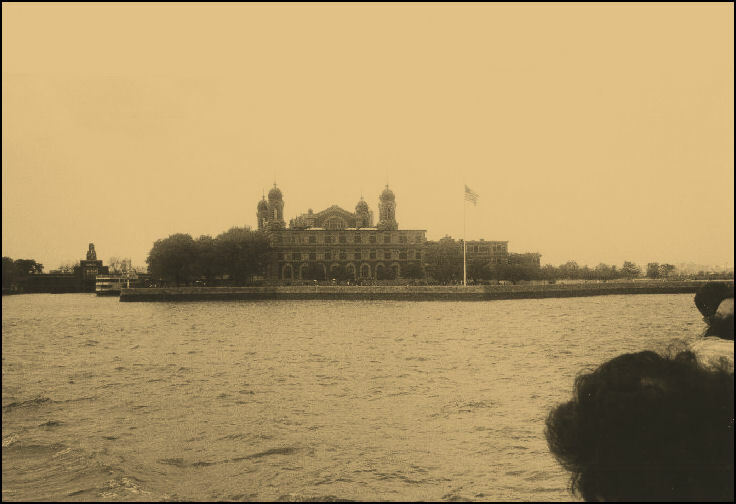 By the time Ellis Island had stopped processing new immigrants, twelve million arrivals had passed through its doors. Eventually, in 1943, Ellis Island would be used as a detention center for enemy aliens. In 1954, Ellis Island closed until it became part of the National Park Service in 1965, and was eventually restored and reopened in 1990. For first and second-class passengers, the immigration officers would actually come on board the ship and examine the passengers on arrival. For those in third-class, or steerage, they would often have to wait for days before disembarking. At that time they would have to board a barge-like vessel, neither heated in the winter, nor cooled in summer, which would take them to the Island itself. There they would wait until groups of perhaps thirty at a time would disembark and enter into the main building to begin the inspection process. Most of those that arrived at Ellis Island made it through the process successfully. As soon as they entered the Great Hall, they began to be inspected by a line of medical examiners. They had a certificate (a "landing card") pinned to their chest before they entered. This would act as a health certificate (they needed to be vaccinated before leaving the ship). The number of the certificate would also be used to cross-reference their names on the ship’s passenger list, or manifest. On Ellis Island, each arrival was inspected for all types of physical and mental disabilities. They were marked with chalk if it was thought that they needed closer inspection. The type of mark indicated what physical or mental condition was suspected. Some defects were easy to spot; others would be discovered on closer inspection. For instance, an arrival would have their eyelids turned inside out to determine if they had trachoma, a form of conjunctivitis that was contagious. This condition was so severe that it could cause blindness. Many of those that had emigrated from Eastern Europe had this condition, and although it could be cured, was grounds for sending the arrival back to their home country. Their scalps were also examined carefully to see if they had favus, a fungal infection of the scalp and nails. There was a hospital built on Ellis Island in 1902, where good medical care awaited the sick arrival. Often, a person would have to stay there for days until they got better before they would finally be admitted. Many times, a child would have to be separated from their family until the ill person became well again. In 1911, a contagious disease hospital was built on Ellis Island. Of course, if the sick person did not get well, he or she had to be sent back to where they began their journey. This must have been horrible because it caused families to be separated. They might have thought this separation would last forever! Others never left the Island. From 1900 to 1954, 3500 people died on Ellis Island, 1400 of them children. However, there were over 300 babies born there! If the immigrant successfully passed through the inspection regimen, they would then have to speak to immigration officers. They had to answer a series of twenty-nine questions to the satisfaction of the officers. These questions corresponded to the information entered for them on the ship’s manifest before they left their port of origin. The inspectors wanted to be sure that the immigrant could find work, and not become a pauper and a ward and burden on the state. Of course, many arrivals already knew what questions would be asked before they got there. One had to know how to answer certain questions. It was often not a good idea, for instance, to say that a job was waiting for you, because that might mean to the officer that the immigrant might be taking a job away from an American, and there was a great fear of this already within the general populace. A person might be sent back home to Europe for this reason alone! Also, an arrival had to have a certain amount of money on them, or at least a ticket to some destination. The U.S. didn’t want to let in vagrants. Sometimes, they would have to show how much money they had. A person could have started out with money when they left from their European port, but could lose it playing cards on the ship during the journey! There were organizations that helped the arrivals along the immigration process, to make sure that they were treated fairly. First there was the Hebrew Emigrant Aid Society, and then in 1883, the United Hebrew Charities took over. Their representative would be stationed there, either at Castle Garden or Ellis Island, in order to help the immigrant in whatever way they could. Unfortunately, this representative did not always speak the language that was needed to communicate with each arrival, and often only spoke German. Many of the towns back in Russian Poland that had "landsmanshaftn" societies formed by people from the immigrant’s hometown, had representation in the major U.S. cities to aid the immigrant in their new life. They aided the Yiddish speaker at Ellis Island. Those that successfully passed through the rigors of inspection could take another boat ride to New Jersey or to 42nd Street where, if they wanted to, could catch a train to a different destination. The major railroad lines ran special trains for immigrants to most major cities. For those who wished to remain in New York (seventy percent of immigrants arriving between 1895 and 1914 did so), many were greeted by their kin, or by friends, joyously waiting to embrace and to kiss them. From there, they could walk to the Jewish Quarter on the Lower East Side of Manhattan where they would settle in and prepare themselves for their new lives. At one time, this section of Manhattan, barely a mile and a half square, encompassing an area mostly east of the Bowery and south of 14th Street, held 520,000 people, and was considered the most densely populated area in the world! "A Short History of U.S. Immigration" and "Health and Immigration."